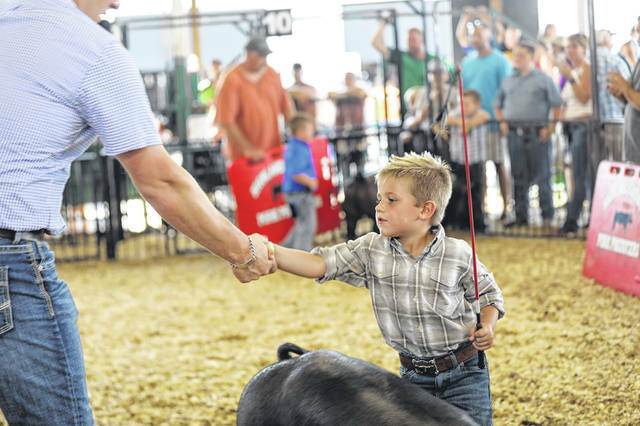 This youngster is shown shaking hands with the judge at a hog show at the 2018 Highland County Fair. Organizers of the Highland County Fair may nix the first Saturday of the event next year, citing economic and practical reasons. Mark Baldwin, who will be the senior fair board president in 2019, said while there is nothing set in stone, a special committee comprised of junior and senior fair board members has been mulling the change and expects an official decision from the Ohio Department of Agriculture sometime in January. Fair board members on Thursday gave reasons ranging from admission income to carnival ride schedules. Dave Stratton, a longtime senior fair board member, said the first Saturday of the fair was added six to eight years ago because many of the livestock shows went as late as midnight or 1 a.m. and coordinators felt there needed to be more time. Baldwin said the amount of youngsters showing livestock has dwindled over the years and as a result, shows don’t go as late as they used to. Now, coordinators are looking at ways to condense the fair, and the first Saturday is in the crosshairs. Baldwin also said “money through the gate” is another factor being discussed. While Stratton said attendance on the first Saturday is largely dependent on weather, Davidson said the fair doesn’t tend to take in a lot of gate income that day anyway. Davidson also said carnival ride booking somewhat plays into the decision since many ride companies don’t prefer to book two weekends in a row. Stratton said the committee discussing the change is creating a tentative schedule for the seven-day fair that will be given to other departments for review. According to Davidson, fair organizers are also discussing switching the sheep and goat barns and moving the skillathon challenges to sometime in August. Davidson said holding skillathons during the fair presents conflicts for children with exhibits.